For today’s tee, I took my easy tee pattern and modified it to include raglan (baseball tee style) sleeves. 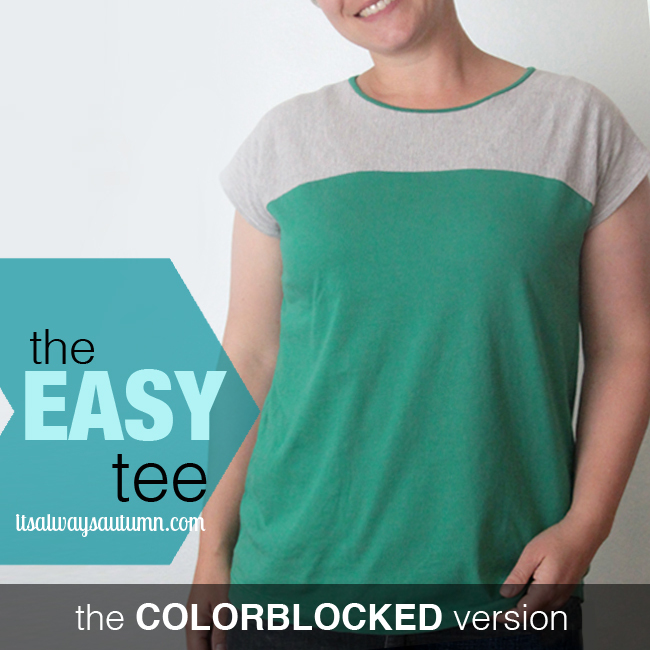 This is a really fun modification for two reasons: 1) adding a raglan sleeve the right way eliminates some of the bunching you see near the underarm in the original easy tee, which is a dolman sleeve shirt, and 2) raglan sleeves open up a lot of options for color and pattern mixing. 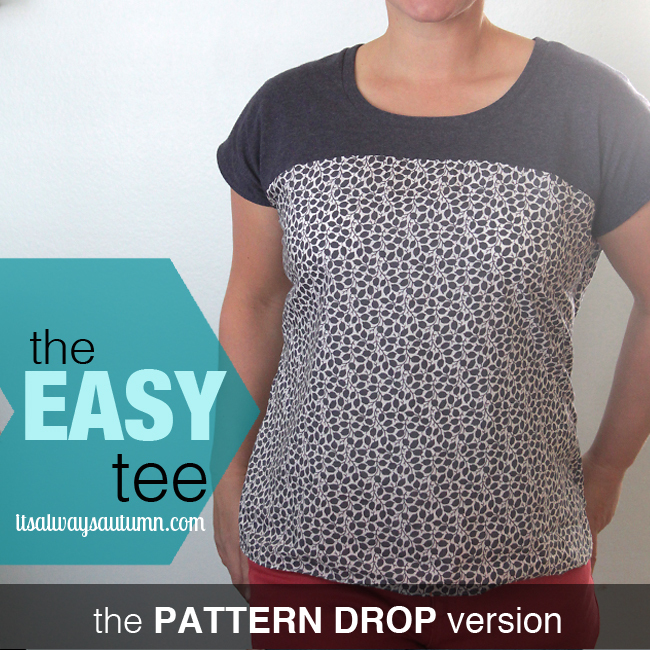 Today’s post will show you how to create your own raglan sleeve pattern the right way. 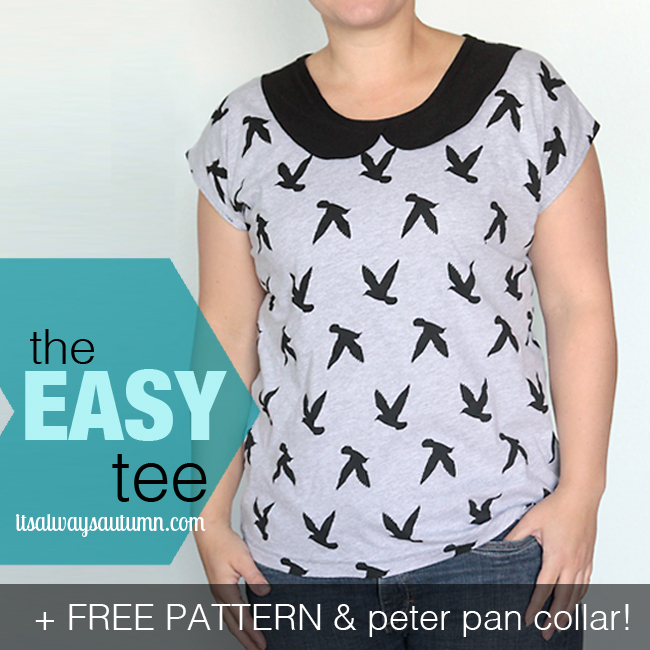 If you don’t want to make your own pattern and you happen to wear a size L, click through to this post for a free PDF pattern! FYI: I used this fabric from Girl Charlee. 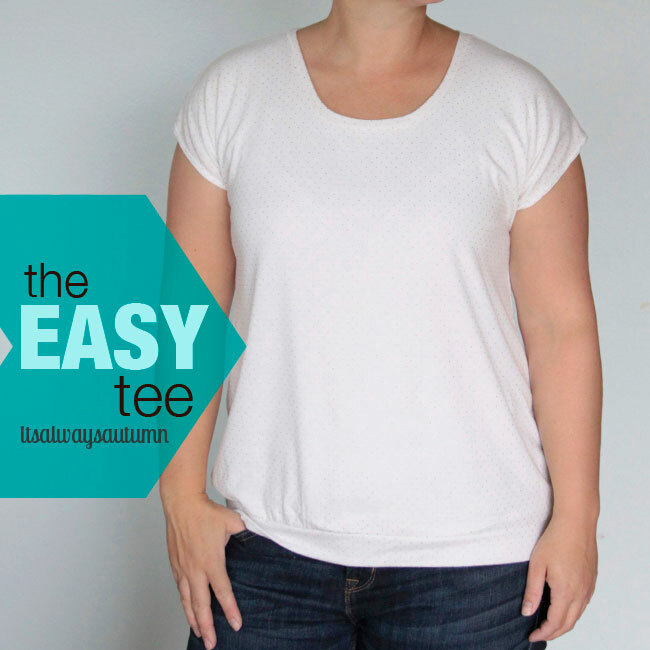 I’ve seen tutorials on blogs before that show how to add a raglan sleeve, but they always skip the step that gives a raglan sleeve shirt a better fit than a dolman sleeve top (where the sleeves are just part of the shirt, not their own piece). To do it right, follow these easy steps. 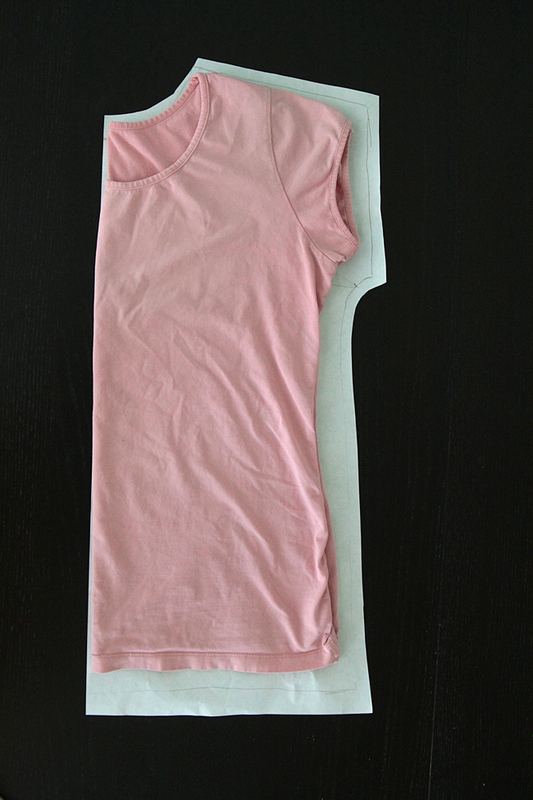 Cutting the curve in your pieces will make the shirt lay flat across your chest/underarm area for a better fit. 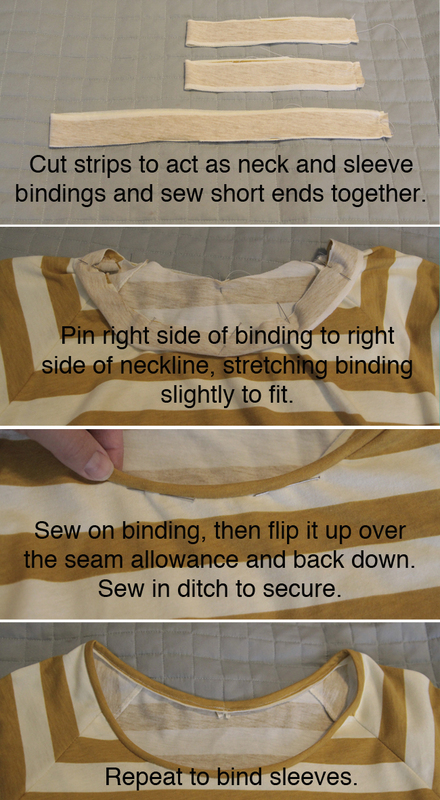 Cut your bodice pieces on the fold, as seen below. Cut 4 of your sleeve piece, turning it 90 degrees before laying down on your fabric (this makes sure the sleeve will stretch across your arm). 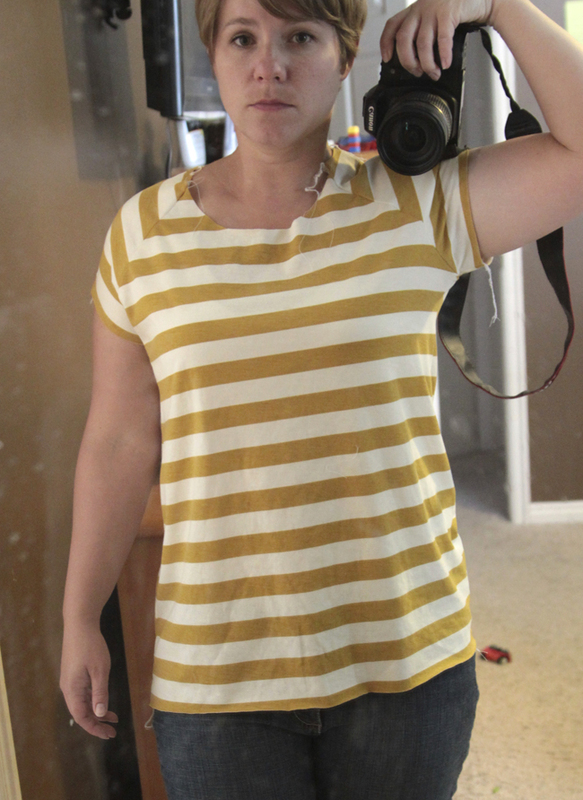 I used strips of knit to bias bind the neckline (like I did in the colorblocked version) and the armholes. Turn it up and hem (use a double needle like I did on the peter pan version or a single row of zigzag stitching to make sure the hem stretches). I have loved all of these tees, but I think this raglan version is my favorite! And check out your pattern matching! 1. 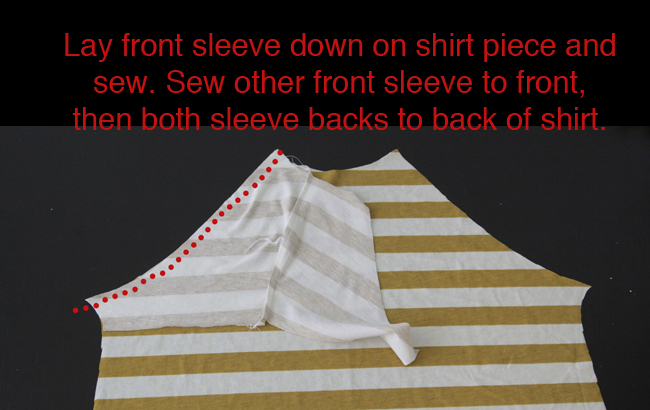 Cut the front of the T-shirt out separately and be sure to lay the underarm seam at the top of the same stripe on both sides. If you have a multiple stripe fabric make sure to line up all the pieces on the same stripe. 2. 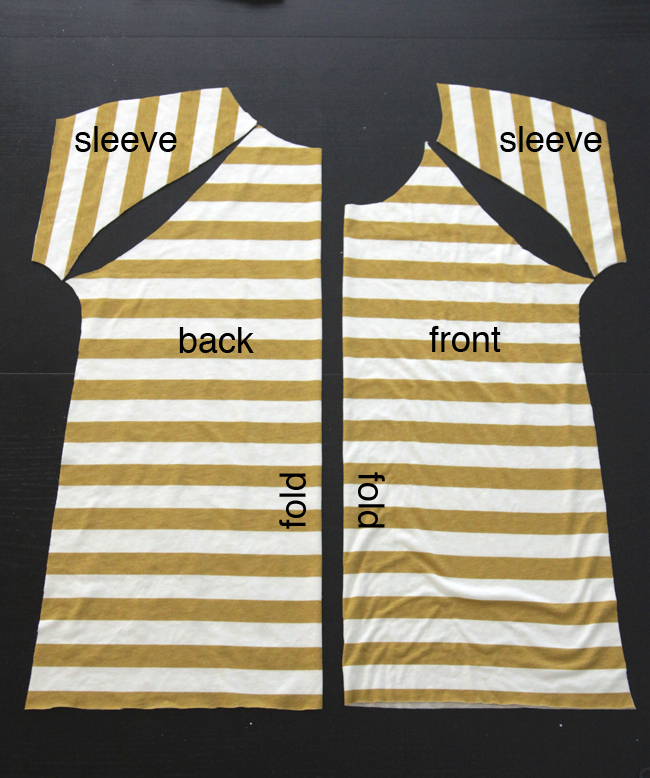 Lay the underarm points of the sleeve on the same stripe as you did for the front and back. Always cut each sleeve out separately! Never fold striped knits in two and then cut out 2 sleeves at once! 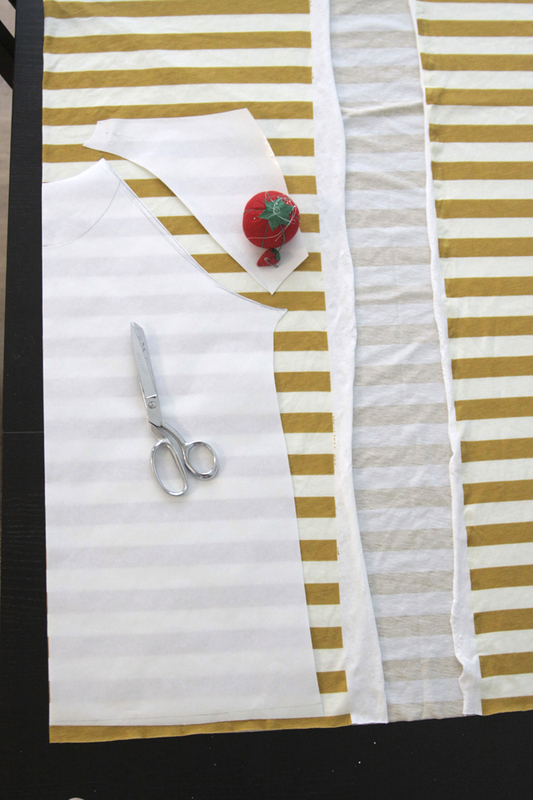 Always use one thickness of STRIPED knit fabric when cutting out T-shirts. 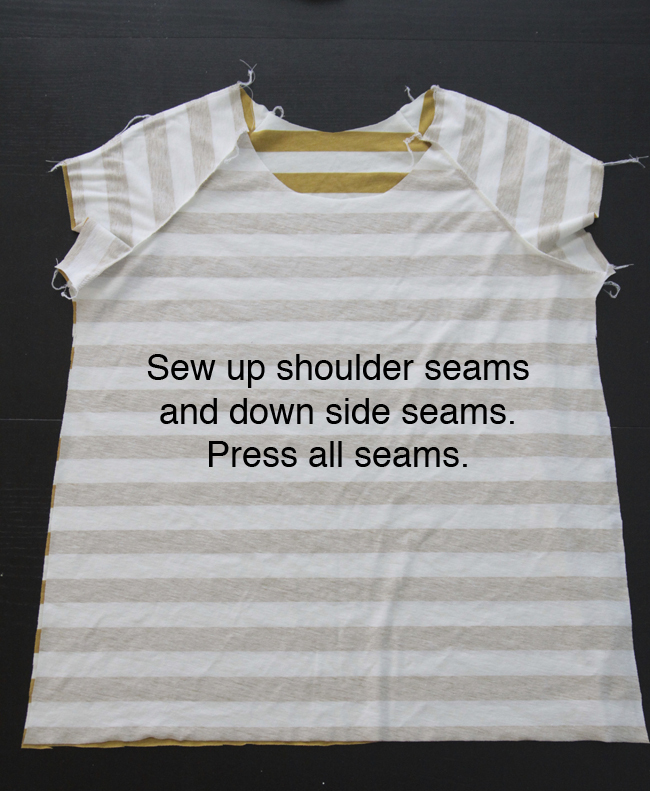 If you are using a solid knit or small pattern knit you can double it and cut two sleeves at once. I hope this helps! Esta es la mejor versión de mangas raglan que he visto . Yo la cortaba recto .Me faltaba su curva. Love love love. And you are so cute in the pics! Ja ja he vuelto para cortar según sus indicaciones ,veo que amamos sus fotos . Me olvidaba su pollera es bella ,bella. I love your tutorials! I’ve pinned all of your shirt tutorials. I’m a quilter and haven’t been brave enough to make anything to wear, but you’re giving me confidence to try. Can you give a few more details about how to draw the curve? I don’t understand how to draw it so that it will properly. Very useful post, Thank you very much!! Thanks for the great tutorial! I’ve been looking for a way to improve the fit of a tight raglan sleeve and I think I finally found the answer. By the way, my Stretch and Sew book recommends making the neckband 3/4 the length of the neck seamline (plus the seam allowances for joining it into a band) to make it lie flat, I hope this tip helps other sewers. Thank you for this helpful tutorial. The shirt fits great. Question: How much fabric, measured at its widest, do you cut away when you curve the line for the raglan seam? 1/2 inch on each piece, more, less? Thank you. Hi, thanx for sharing this pattern. I just wanted to know it the seam value allready in it or should I draw it extra on the pattern? half an inch seam allowance is already included – thanks! Thanks for the pattern and instructions! I modified by cutting the sleeves on the fold instead (I didn’t like the extra seam on my arm), I lengthened both the front and the back and cut a bit more curve into the bodice so that its fitted. I’ve done two practice 3/4 sleeve shirts and now I think I’m ready to try making a dress! Thank you so much for the pattern and tutorial! It fits me perfectly ? Excellent tutorial. Clear directions and photos make it easy to understand.